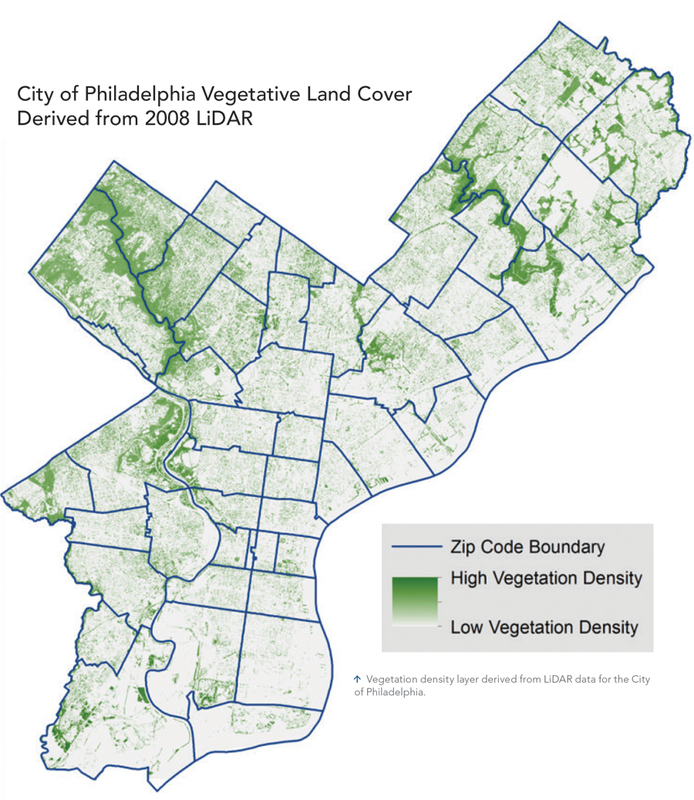 Vegetation density layer derived from LiDAR data for the City of Philadelphia. Following Hurricane Sandy in 2012, the City of Philadelphia, Pennsylvania, began developing its first comprehensive debris management plan to provide coordinated and efficient debris removal. Esri partner Dewberry, a consulting firm, used ArcGIS to evaluate sites that would be used to process disaster-generated debris. Not only would better debris removal expedite recovery efforts, it would improve opportunities for reimbursement through the Federal Emergency Management Agency (FEMA) Public Assistance Grant program. As part of this major planning effort, the City of Philadelphia Office of Emergency Management (OEM) recognized that the advance selection of suitable debris management sites—temporary locations to store, reduce, segregate, and process debris before final disposition—would be critical to effective recovery efforts following a major disaster. Public Assistance: Debris Management Guide published by FEMA identifies the advance selection of debris management sites as a best practice for debris management planning. OEM, in coordination with the Southeastern Pennsylvania Regional Task Force, selected the consulting firm of Dewberry to evaluate available space in the city to process disaster-generated debris. The scope of this effort included forecasting potential quantities of debris that might be generated under select scenarios and assessing the suitability of 30 potential locations. 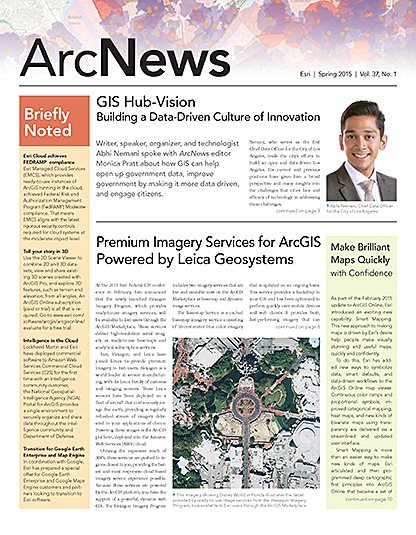 The geospatial analytic capabilities in ArcGIS were instrumental in Dewberry’s efforts to develop the forecasts, analyze the sites, provide detailed documentation, and meet the deadline. OEM will use the data gathered from this project to identify and activate the most suitable temporary debris sites during a disaster. “Comprehensive disaster planning has been the cornerstone of OEM’s mission. Our attention has now shifted to implementation, and we specially focus on the operational integrity of our plans. This study is a great example of ensuring operational integrity and supports our ability to deal with debris in a major event,” said Samantha Phillips, director of emegency management for the city. The list of 30 potential debris management sites (DMS) was prepared with the input of nearly a dozen agencies, including OEM, the Philadelphia Planning Commission, Streets Department, Water Department, Department of Parks and Recreation, the Pennsylvania Department of Environmental Protection, and the Pennsylvania Emergency Management Agency. In generating this initial list, the city’s evaluation criteria included the size and capacity of the property, its type of ownership (publicly owned properties were preferable), whether or not the site was paved, ease of access, and potential issues with prior environmental contamination. Philadelphia Debris Site Management ArcGIS Online website was used to perform the desktop reviews and track field progress. During the first phase of analysis, Dewberry applied debris volume forecast models based on three disaster scenarios selected by OEM. These scenarios—a 1-inch ice storm, a 500-year flood event, and a Category 1 hurricane—are events that the city could likely experience. Forecast findings provided a basis for determining overall DMS acreage requirements and assessing individual site suitability. In addition to general debris forecasts, the team assessed potential quantities of debris that would become the city’s responsibility, such as debris in parks as well as debris located in roadways and right-of-way areas that would be eligible for FEMA funding. The information gathered about potential sites and assessed included details such as proximity to fire departments and landfills; proximity to sensitive areas such as residential neighborhoods, schools, and hospitals and position relative to prevailing winds; environmental sensitivity; and preexisting site characteristics including site security, fencing, utilities, roads, drainage, lighting, and proximity to major roadways. Using the tools in ArcGIS, a combination of LiDAR and a vegetation cover data layer was used to determine the density of vegetation. This enabled the team to project the potential for downed trees in roadways, which was a more likely scenario in the northeast and northwest parts of the city. Dewberry then screened for each site based on GIS data provided by several of the agencies. The Philadelphia Debris Site Management ArcGIS Online website was used for screening of sites as well as tracking the progress of the field surveys and viewing geospatial data while in the field. In addition to the city’s initial criteria, factors such as current zoning and land use; environmental and historic preservation issues; and proximity to residential zones, critical facilities, and other sensitive locations were also considered. Proximity of potential sites to other locations was calculated using a shortest route analysis available from ArcGIS Online. 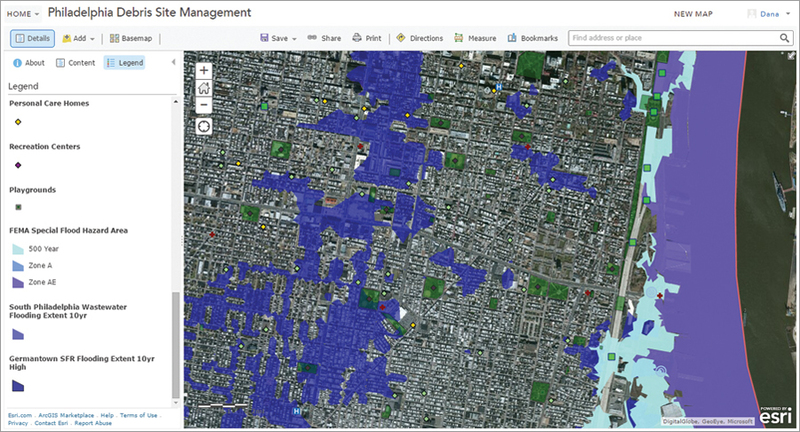 Data for historic districts and properties was also made available through the ArcGIS web application. Following the desktop reviews, Dewberry team members conducted field surveys to collect and verify additional data. During the field surveys, several photographs were taken of each site. For a select number of sites, interviews were conducted with personnel who were familiar with the site layout and its operational challenges. 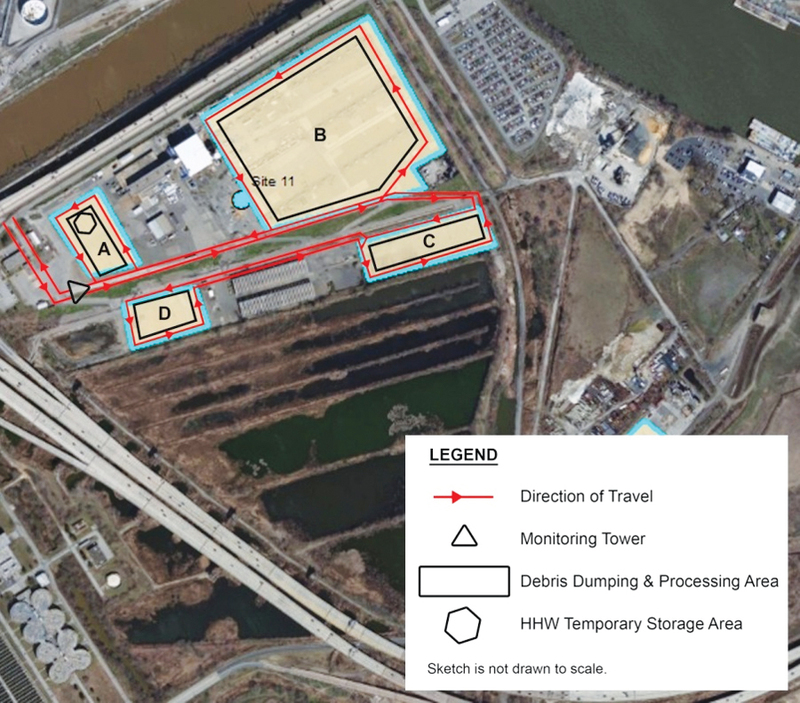 A diagram was created for each site detailing its entry and exit points; the direction of travel within the site; the location of monitoring towers; dumping and processing areas; and staging areas for household hazardous waste. These diagrams will help the city ensure a turnkey process for debris operations in a major event. A site sketch on the ArcGIS Online site depicting the location of monitoring towers, dumping areas, and the direction of travel within potential debris management sites. With this extensive data, the team produced a qualitative assessment of the types of debris that could be processed or stored on each DMS. Debris types were categorized according to the Public Assistance: Debris Management Guide and included categories such as vegetative, construction and demolition, white goods, household hazardous waste, and electronic waste. Processing activities were also examined. They included staging, chipping, and grinding; disposal; and recycling. A calculation was performed to determine the total land area requirements needed to remove the debris generated from the forecasted scenarios. This analysis took into account the rate at which processed debris would be hauled from the site, which would then allow additional collected debris to be dumped at each location. The information was compared with the available acreage at each DMS and the equipment required to meet a 90-day removal time frame. With the forecasts and thorough site evaluations in hand, Dewberry presented the findings to the city’s multiagency planning team. Dewberry delivered the data in an ArcGIS geodatabase. It included detailed site diagrams that showed the optimum setup for each DMS. A suitability matrix was provided that ranked sites based on proximity to debris, size, ownership, existing use, public impacts, site layout, and environmental sensitivity. The firm also presented more than 20 recommendations for additional planning and ongoing updates. OEM is currently working with its partners to approve the site list to prepare for DMS operations in a major event. The final report from Dewberry, developed with ArcGIS tools, enabled the City of Philadelphia to make informed decisions as it prepares for potential natural disasters in the years ahead. For more information, contact Matt Werner, infrastructure program manager for the City of Philadelphia Office of Emergency Management, or Catherine Bohn, senior project manager at Dewberry.